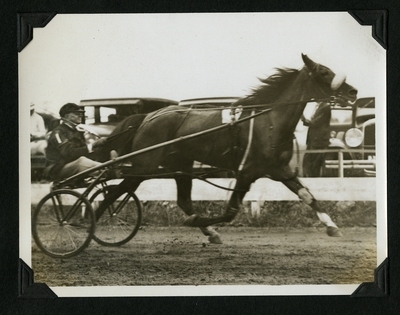 Black and white photo of bay mare Miss Volo driven by 2.18 Class pace on July 4, 1931 at the Bay State Circuit, Sage Park, Windsor, Connecticut. Calumet Berth finished fifth in the contest. Mis Volo finished first in all three heats claiming the $400 purse.